Away from the pitch, here are some of the winners and losers from the World Cup in South Africa [ ]. FIFA [ ] - Soccer's governing body was a very clear winner, mainly thanks to the sale of TV rights but vigorously guarding other revenue streams. FIFA revenue topped $1 billion for the first time in 2009. From World Cup TV and marketing rights, FIFA said accumulated revenue collected from the start of 2007 to the end of 2009 amounted to nearly $2.6 billion. Their full income and profits from the competition will only be clear afterwards. SOUTH AFRICA'S IMAGE - South Africa proved wrong the doom-mongers who had warned of everything from mass crime to race riots to incomplete stadiums to poisonous snakes. It hosted a relaxed tournament without major hitches. Fans from around the world spoke of what a great impression they now had. PRESIDENT JACOB ZUMA [ ] - President Zuma came across as the perfect host, able to present South Africa to the world at its best. For the tournament at least, he put behind him scandals over his personal life and squabbles within his ruling ANC. SOUTH AFRICAN POWER WORKERS - Whether or not their bargaining strength was increased by a threat to strike during the World Cup, workers at Eskom managed to squeeze a nine percent pay rise from the utility -- around double the year-on-year inflation rate in May. 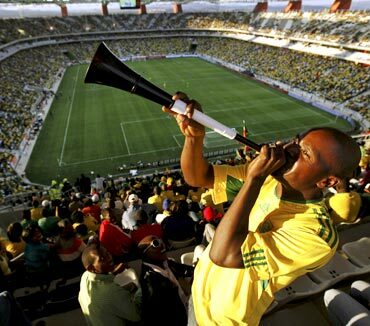 VUVUZELA MAKERS - Players and the world's TV viewers may hate the noisy plastic trumpets, but they have made a fortune for their makers. South Africa does not benefit much as 90 percent come from China. At one point, the Ninghai Jiying plastics factory in Ningbo was making 250,000 a day. WOULD-BE HOSTS - Thousands of South Africans who had expected to make a killing from the World Cup by renting their houses at inflated prices were left empty-handed after tourist numbers were far lower than expected. Some people had spent heavily to improve their homes for visitors who did not come. CRIMINALS - While there was certainly petty crime, there was no major impact on the World Cup. Police said that tougher reporting had meant a significant drop in crime levels in one of the world's worst afflicted countries. South Africans will be asking why police can't deliver such results all of the time. NEIGHBOURING STATES - Some neighbouring countries had been counting on a tourist influx and had even hoped to host training camps for competing teams. Although Zimbabwe managed to pull in Brazil [ ] for a friendly match, there was no sign of any more tourism boost. SOUTH AFRICA'S ECONOMY - The government says the tournament, which cost over $5 billion to host was a roaring success, but the impact will only be felt over a number of years so it is still hard to judge whether it was money well spent. The government estimates it will add 0.4 percentage points to growth in 2010, which is estimated overall at 2.7 percent. While a couple of brand new stadiums in remote towns are of dubious long term benefit, much money went on infrastructure which needed upgrading anyway. But it is hard to see whether South Africa will realise its hopes of attracting millions more tourists in coming years as a result of a successful Cup.